Camping isn’t the same as it used to be according to a recent survey by Kampgrounds of America. No longer is the Great Outdoors the one-size-fits-all experience founded on a need to escape modern living. Today’s 21st century campers are demanding a larger scope of services than ever before, including the desire for ubiquitous connectivity in RV parks and campgrounds across America. 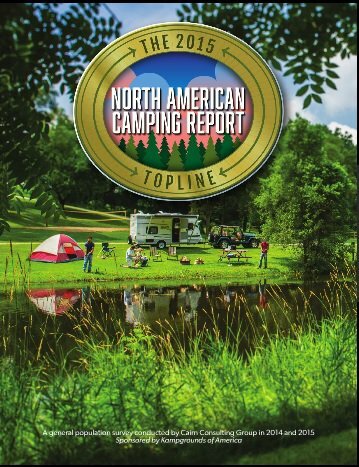 In the 2015 North American Camping Report by Kampgrounds of America, 5,800 campers were surveyed to find out what they really want in a camping experience. With over 83% of all outdoor lovers bringing cell phones on camping trips and 61% of adults aged 34 – 44 going online at least once daily, the survey revealed that a large segment of these visitors want ubiquitous, free wifi at campgrounds. The Elkhart Truth Newspaper revealed that at the annual RV Industry Power Breakfast, Kampgrounds of America CEO Jim Rogers said the study also found that many campers bring their phone, computers and other devices with them to stay connected while on vacation. As the majority of our lives become enmeshed with the Internet and the lines between work and play are blurred, more people than ever expect wifi to be a part of their travel experience. In the KOA survey, free wifi was ranked third in importance as highly valued amenity, just behind clean restrooms and a kid-friendly experience as something that campers value most in a camping experience. More private RV parks and campgrounds are striving to meet the demand for free wifi when camping, but it’s not always easy. Trees, weather and proximity to wifi repeaters that send the signal throughout the campground all factor into how good of an experience a camper has when using free park wifi. For the cash-strapped national and state parks system around the U.S., providing free Internet has been discussed for several years as a means to add revenue to the park system’s budgets but little progress has been made as wifi proponents battle mammoth organizations dedicated to providing a natural experience as free from modern development as possible. The question of whether or not to provide wifi is the sole decision of each park’s administration, and at Yellowstone National Park officials have been weighing the feasibility of installing a $34 million fiber-optic line between Grand Teton National Park and Yellowstone. The backlash has been substantial. Jeff Ruch, executive director of the organization Public Employees for Environmental Responsibility, said increasing the park’s bandwidth would create more “electronic distractions” that could disrupt the surrounding environment. Until the debate in whether or not to provide free wifi at public parks and lands is resolved, modern campers will find free and paid wifi more available at privately-held campgrounds and RV parks.